These are great questions, and I’ve been doing a lot of thinking about how to answer them – because the answers depend on what you’re looking for right now, in regards to your productivity. I think visually, and I know a lot of my community members do, too, so I created a couple of quick graphics to illustrate my overall productivity philosophy and explain the important differences between my two main products. These illustrations will show you why I created each of these products, and the specific problem I was trying to solve with each one. Diagram 1 illustrates how I see productivity with Evernote. 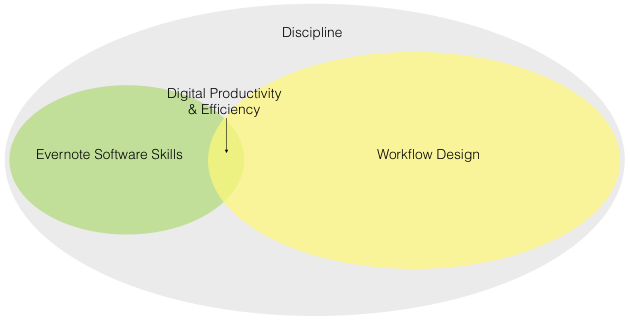 Your productivity exists at the intersection between your software skills and workflow design. That’s the dark yellow area shown in the diagram. I define “workflow” as how you create and organize your Evernote notes, notebooks, and stacks, and the rules you use to process information in Evernote. Unfortunately, almost all Evernote users suffer from what the founding CEO of Evernote termed “The 5% Evernote problem.” Most people only use about 5% Evernote’s features, so no matter what workflows they have, their digital productivity and efficiency are limited. Diagram 2: Decreased productivity when you only use 5% (or less) of Evernote’s features. I created Radical Productivity with Evernote because I saw what a huge difference it made when my clients improved their Evernote skills. If you increase your Evernote skills, you can see a huge jump in your productivity, as illustrated in Diagram 3. I wanted to make it as easy as possible for people to improve their Evernote skills and get this leap in productivity, so I created a comprehensive Evernote course. It’s called Radical Productivity with Evernote, and it’s a step-by-step way to learn all the skills you need to become an Evernote power-user. No matter what workflow you’re currently using in Evernote – even if you don’t have a workflow at all – your productivity with Evernote will drastically improve when you invest in Radical Productivity with Evernote. As my students gain new Evernote skills in Radical Productivity with Evernote, many of them take what they learn and use it to organize their lives in Evernote. Manage their personal and professional tasks. Set up their Evernote structure to make tax preparation faster and easier. I don’t teach these things in my Radical Productivity with Evernote program, because these skills are actually related to workflow design. Workflow design goes beyond Evernote software fluency and expertise, and delves into specific structures and behaviors that enable you to manage your life in Evernote. Two of my products, Radical Productivity with Evernote and the Evernote Setup Guide, teach Evernote software skills. The rest of my products, guides, and programs teach workflow design. Right now, my main workflow design product is a guide called EverDone®, which walks you through the organization and habits that are required to manage David Allen's Getting Things Done® in Evernote. I’m currently working on additional workflow design products that will be released in 2018, including Trauma-Free Taxes with Evernote and Starting Fresh with Evernote. Which Product Should I Invest In? My Best Advice. If you need to improve your Evernote skills (if you’re suffering from the 5% problem), I recommend Radical Productivity with Evernote. If you already feel comfortable with Evernote, and you want to implement a workflow or an organizational system, check out one of my workflow products, including EverDone®. If you want to improve your Evernote skills AND implement a highly efficient workflow system, I recommend investing in a few of my products. By design, there is very little, if no overlap in the curriculum of my products. The only place I cover Evernote skills is in Radical Productivity with Evernote, and my other e-books and guides will each teach you different Evernote structures. Questions? Need helping figuring out what course will be the best fit for you? Contact me here to ask a question about Radical Productivity with Evernote or EverDone®.